The Sitar is the most popular melody instrument in Hindustani (North India and neighbouring countries) classical music with a long neck. The large resonant box is made of a dried pumpkin while the rest is mostly made of Tun wood, an Indian variety of teak. Strings made of steel and brass or bronze run across rounded frets and two bridges. 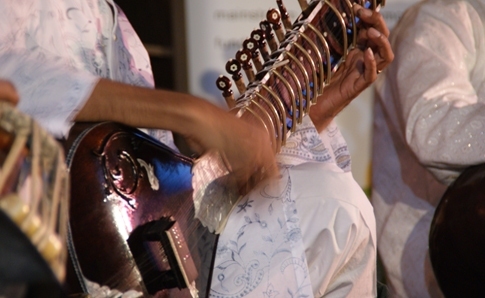 The smaller bridge holds the tarabs, a set of un-plucked ‘sympathetic’ strings that are tuned to each musical note, vibrating when the main strings are played, adding resonance to the Sitar’s characteristic sound. The Sitar is played in a sitting position on the floor. The pumpkin body rests upon the musician’s foot and the instrument is held at 45 degrees. The strings are plucked using a wire mezrab (finger picker) on the right index finger. Famous sitarists include George Harrison of the Beatles and his teacher, Pandit Ravi Shankar, along with Ustad Vilayat Khan and Pandit Nikhill Banerjee.